They’ve taken over. First the refrigerator where they lay in wait for someone to unleash them from their cold prison. Then the sink as one by one you are forced to snap, soak and strain each one by hand as you suffer back and neck strain from hunching over. Huge pots of boiling water anticipate the arrival of these little green delicacies that bob in the bubbles for just a few minutes before being plunged into an ice bath. 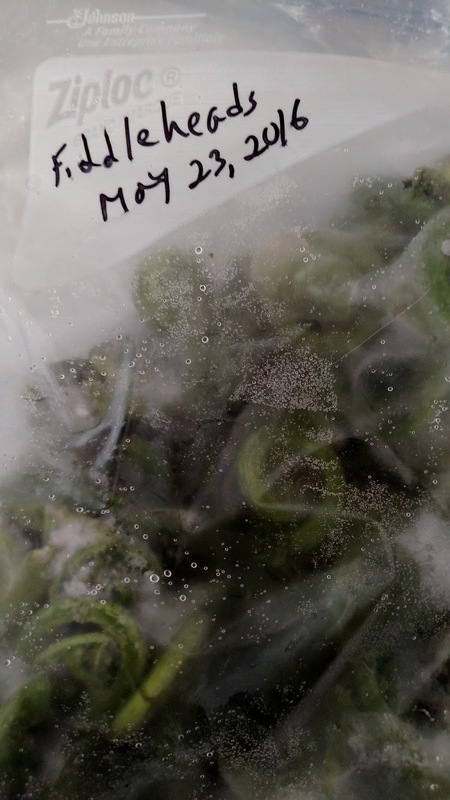 Finally, they are dried off, bagged up and frozen to partake of at a later date, but be warned – you have to make sure to cook them for the appropriate time upon thawing or you may find yourself a victim of Montezuma’s revenge. It is time consuming and tedious, but it’s worth every grueling minute. It is the season of fiddleheads. His dad would pack waders and disappear for the whole day somewhere “up North” in the Connecticut hills to scour through swampland in search of curly green treasure. None of this sounded like fun to me, but he would return at the end of the day with a victorious smile and buckets loaded up with funky looking green things the likes of which I had never seen or even heard of. They really do resemble the heads of fiddles, except for being green, soft and edible. Fiddleheads are a cross between asparagus, broccoli, spinach and nothing you’ve ever tasted. They are very hard to come by because the harvest season is painfully short, allowing just a brief window in spring to find them. So it was with great excitement that I welcome five pounds of them into my home last week when I discovered a friend “knew a guy” and was willing to deliver. Remember the part about my father-in-law wading through swamps foraging for fiddleheads? He had the easy part. Last Monday night I was up until 11 p.m. working on the “treasure” from my fridge. By the time I had gotten to them they were just starting to lose their freshness and I had to act fast. Vats of boiling water and bowls of ice water stood ready for Stages Two and Three. But first, there was Stage One – cleaning them. Every. Single. One. Does anyone know how much five pounds of fiddleheads is when it comes to cleaning each one? About four pounds too many, that’s how much. If they could understand me those little buggers might have learned a few choice words as I hovered over the sink snapping the brown ends off each one and washing their little green bodies. Yes, bodies – by the second hour of washing I was delirious. At one point I was so tired that I didn’t realize I was tossing the fiddleheads into the sink and saving the ends in the colander, which meant rewashing them. My normal bedtime is ten at the latest. I cannot be held responsible for my actions after that. I rinsed, boiled, iced, dabbed and bagged every last fern (at that hour they were downgraded to a four-letter word) until my kitchen and my clothes were a disaster. After cleaning up the mountain of kitchen items from this production I sprayed room deodorizer to eradicate the stench – I mean scent – of boiled plant heads and collapsed into bed hoping to dream of anything but green vegetables. For now our supply is tucked safely away in the freezer until we decide to take them out and complete the cooking process. I sincerely appreciate those who brave the swampy waters and provide us with this rare goody for a short time, and heartily applaud the ones who tackle such a persnickety preparation. As exhausting as it was, and having learned my lesson about the preparation of certain produce, at this time of year the elusive fiddlehead is my best frond. Wow, I see fiddleheads at the market and I always wonder, "What do you do with those?" I can't bring myself to buy them without knowing first what they taste like. Email me privately and let me know how long you boil them, and when the defrost, how long you cook (boil again? saute?) them to bring them back to life. Thanks for writing this. Excellent!